This is a true Johorean Beriani which is an all-time favourite in my household. The main trick to the success of this dish is to follow the water measurements accurately (1 cup of rice to 1 1/2 cups of water), get the best rempah beriani & you should not miss out the coriander - Vital to the final flavour. Put the basmati rice, water, ginger juice, rose water soaked with saffron and salt in a rice cooker. In a small pan, heat oil & ghee. Put the cinnamon, star anise, cloves, cardamoms and screwpine leaves in the hot oil. Sautee the shallots and garlic. Pour the ingredients from the pan into the rice cooker. 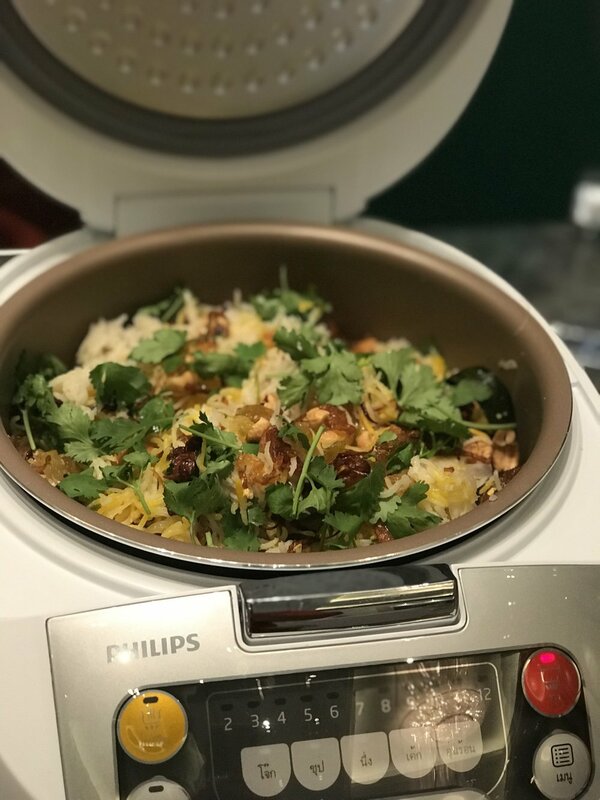 The moment the rice is cooked and steaming, pour in the thairu (milk mixed with lime juice) and throw the fresh coriander in the rice cooker. Close the cover back quickly. Create a hole in the centre of the beriani and put the cooked kuzi lamb/chicken and eggs into the hole. Let it rest a while. When serving, sprinkle with cashew nuts, sultanas and crispy fried shallots. In a pan, heat the oil and ghee. Put in the cinnamon, cloves, star anise and cardamoms. Sautee’ the blended ingredients and the rempah beriani. Put in the lamb shoulder. Coat the lamb with the rempah and blended ingredients. Put in the tomato puree & carrots. Pour in the water. Add the boiled eggs. Cook on low fire covered. When the lamb is tender, add tomato wedges, coriander roots, Chinese celery, mint leaves, spring onions, honey & salt to taste.